It is relatively easy to use. Work was smooth and easy to do. This review is about item#57859261. We are using it to polish rusted bolts and parts. It is easy to hold and easy to use. 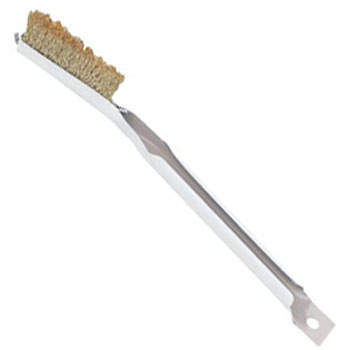 It is used for rust removal treatment before painting and washing treatment with washing oil. Since the tip of the hair is unexpectedly hard, it scratches depending on the place of use, so I use it properly according to the purpose. There are things that are used less often and it lasts longer. Although it is quite hard, it is suitable for rust removal on a wide surface It is not suitable for parts cleaning and bolt rust removal. I purchased it as a disposable but it can be used for a long time unexpectedly. Easy to grasp and improve work efficiency. Brush is also solidly made and satisfied.